Title out of print, an update will be sent within one to two weeks. Theater-goers may remember this deftly phrased song from the duo's delightful show, At the Drop of a Hat (1959). The witty story of the hippos' courtship is embellished with sleights-of- versification like rhyming ``The fair Hippopotama'' with ``she hadn't got a ma'' (not to mention ``His enamorata adjusted her garter'') and punctuated with an irresistible refrain (``Mud! Mud! Glorious mud!...''). 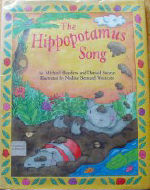 The rollicking, frolicking love story in rhyming verse of two hippopotami is presented in picture-book format with music for piano and voice. The muddy setting is humorously captured on double-page spreads in bold colors and in the refrain: ud! Mud! Glorious mud! / Nothing quite like it for cooling the blood. / So, follow me, follow, down to the hollow, / And there let us wallow in glorious mud. -- Copyright © 1992 The Horn Book, Inc. All rights reserved.